Boba Fett, originally uploaded by AndyBartlett. 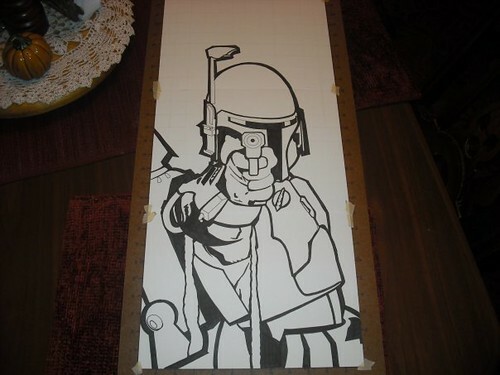 Here’s an in-progress shot of my three-panel illustration of Boba Fett. I’ve completed inking work and am ready to begin coloring. I have a couple more in-progress shots of this piece that I took during the penciling phase; I’ll upload those later in a complete blog post on the finished piece. I’m pretty happy with this; there are some significant flaws (one of which bugs me mightily), but even at this stage in the process I’m very pleased with how this is progressing. I’ve begun coloring, but don’t have any shots of that to show here yet. The drawing is 12×27 (three 9×12 panels) and is attached to a custom-cut work board. Medium: Prismacolor brush-tip black on Strathmore 300-series 100lb Bristol board (vellum surface).